One of the many natural toothpaste brands fans send us a link to review and write an article about Tooth Builder by Squigle. Before that, I never heard of Squigle. But Squigle is not a young company. They are on the market since the 1998 year. They claim that in recent years they were 6th most popular toothpaste on the internet and saying that top 5 places take big guys that spend millions on advertising. I m euphoric to read on their website about SLS and other irritating ingredients. They are aware of them, and they know that many “natural toothpaste brands” still use chemicals that have nothing to do with the natural world. Just remember our recent reviews of several Ayurvedic kinds of toothpaste. Squigle claims they do not use any detergents, irritating chemicals or other chemical substances that are a hazard to the human’s health. But you need to be careful with Squigle because it contains 36% Xylitol. Xylitol is harmless to humans, but it is very dangerous if your dog licks it. Make sure your dog goes nowhere near Squigle toothpaste. That means you are safe to use it, and you won’t have any allergic reactions. Squigle toothpaste is not tested on animals, and it is free from all kind of chemicals that are known to be harmful to health. But Tooth Builder is not vegan-friendly since it uses lactoferrin, lactoferrin has the antimicrobial purpose and it is derived from cows milk. It would be better if they obtained this protein from rice or some other plant. But lactoferrin is not a dangerous ingredient. Mothers milk in the first days of baby’s birth contains six times more lactoferrin than cows milk. Methocel is really not needed chemical. Squigle says it is derived from trees, and that is fine and natural. But toothpaste does not need to foam. If it foams, that does not mean it will clean your teeth better. Cellulose Gum is another additive, yes I am using word additive despite they claim not to use additives. But Tooth Builder use additives, with additives products, are selling better and last longer. But the good thing is that they claim all their additives are obtained from nature. Cellulose gum is naturally found in all plants. Poloxamer is probably the worst ingredient in Tooth Builder Toothpaste. Poloxamer is a controversial part. There is not much info about it. But one study shows that it can increase High Cholesterol if taken in significant amounts. But in toothpaste we have small numbers, so the danger is not real. Glycerin is not needed in the toothpaste like we said many times before. 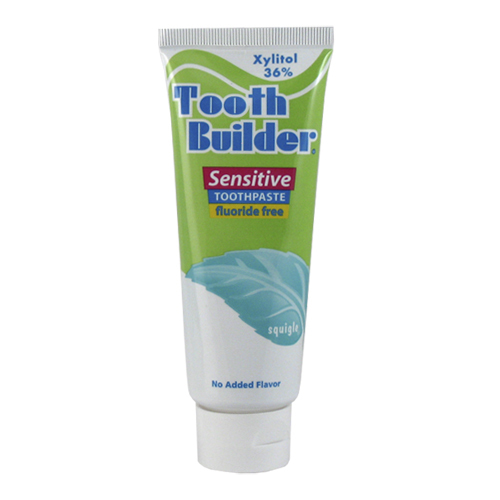 Squigle Tooth Builder Toothpaste is promising, it does not contain any dangerous elements. But it is not vegan-friendly because of lactoferrin obtained from cows milk. It contains natural additives to make this product attractive. I can’t rate it 10/10 because 10/10 is natural toothpaste that has zero or just a few questionable ingredients. Unfortunately, Squigle has more than one controversial element. But I need to say that Squigle toothpaste is safe to use.